Mural a few blocks from Hotel San Jorge at the Tren Urbano station - Sagrado Corazon. 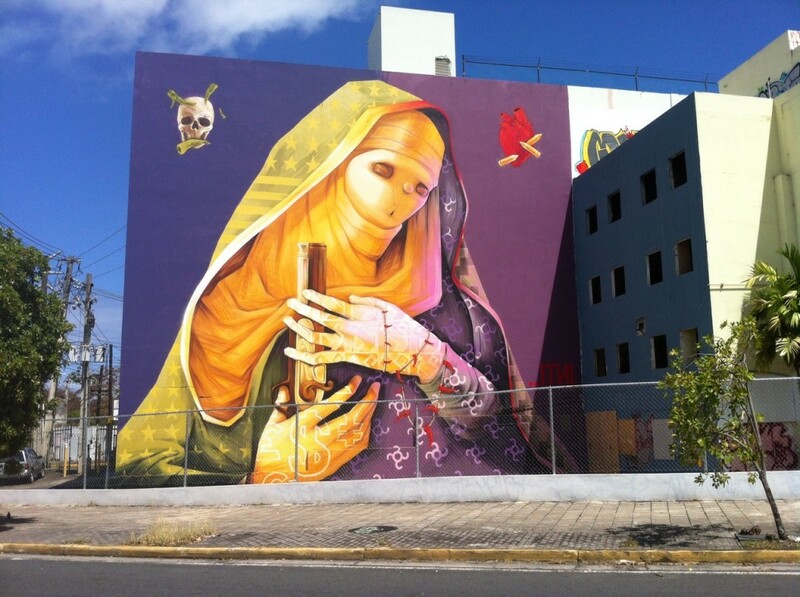 Our section of Ponce de Leon Avenue has been designated as San Juan's 'Avenue of the Arts' and forms the center of the Santurce Arts District - with the highest concentration of arts and cultural venues in the Caribbean! Its easy to reach almost all cultural attractions. You can start with the San Juan Children's Choir which is just across the street and walk along Ponce de Leon Avenue to Fine Arts Center at 'parada 22', Plaza del Mercado at 'parada 20', the Museum of Contemporary Art at 'parada 18',the new Conservatory of Music at 'parada 15' and the Miramar Historic District at 'parada 12'. You can see a good overview of the entire arts district at www.avenidadelasartes.com (website in English). We are located at 'parada 25' but the entire arts district is easy to reach with the M3 bus which is just across the street. If you want to combine beaches, history and arts - Hotel San Jorge is a great choice for your visit to San Juan. The following cultural venues are within a short walk or bus ride from The Hotel San Jorge. Just 3.5 blocks from the hotel – Lote 23 is one of the hottest scenes in San Juan. With 15 food trucks and food stands – you’ll always find something interesting. Lots of entertainment and special events, plus Yoga every Sunday morning. Your biggest challenge is choosing what to eat! BOMBA! Don’t miss this celebration of Afro-Caribbean music and dance every MONDAY just one block from the hotel. Take Calle San Jorge up the hill to Ave. Eduardo Conde and follow the music! Its an authentic Puerto Rican experience in a typical chinchorro ‘road house’ type bar that is rarely seen in the city anymore. They are open every night for cheap drinks and bar food menu – but Monday night is BOMBA! This area between the beach and our hotel is often referred to as a laboratory for ‘hipster’ entrepreneurs. New restaurants, boutiques, tattoo parlors, galleries, food trucks, bars and clubs blend in with traditional shops and restaurants that have been there for decades. Only 15 min walk from the hotel. Santurce’s fruit and vegetable market by day – this classic building is surrounded by restaurants and bars. On Thursday and Friday evening, there is an informal street party that has become a San Juan favorite. Its about a 15 minute walk – but the bus stop is just one block from the market, so its easy to party and then grab the bus back to Hotel San Jorge. One of the finest art museums in the Caribbean – the Puerto Rico Museum of Art is an easy 15 minute walk or short bus ride from Hotel San Jorge. Just walk down Ponce de Leon for 10 minutes and turn right on Ave. De Diego. Our Fine Arts Center – Bellas Artes is just a 12 minute walk down Ponce de Leon from Hotel San Jorge. With two large theaters, an experimental theater space and cabaret theater – there are performances every weekend ranging from opera to drama, comedy, international touring artists, musicals and dance performances. You don’t have an excuse not to explore the Contemporary Art scene in San Juan, since this museum is free – unless there is a visiting show which may have a modest surcharge. The permanent collection is still growing, but visiting exhibits always make this an interesting experience. Now that they have their own performance space – the Puerto Rico Symphonic Orchestra has developed a stellar reputation and a fanatic audience that fills the new Symphony Hall whenever they perform. Just next to the fine arts center its an easy walk or just a few bus stops from Hotel San Jorge. Just across the street from Hotel San Jorge, the children’s choir performs in major arts venues but have their school and rehearsal space just next door! There is always something cultural going on at Abracadabra, just two short blocks from Hotel San Jorge. Jazz nights, Film Festivals, Circus Arts, Kids Programs, Theater, Poetry and a great creative menu have made this a neighborhood favorite. Just across the street from our hotel – the Gran Logia (Masonic Temple) which is a great example of the grand homes and buildings that lined Ponce de Leon Avenue during the ‘golden age’ from the 1920’s through the 1970’s. Featured in the NY Times as the hot spot in our Arts District, La Respueata has a different attitude every night. Evenings range from poetry slams to disco, 80’s retro, heavy metal, theatrical performances, art exhibits, regguetón, hip-hop or whatever the hip crowd in San Juan is feeling at the moment. Just 4 blocks from Hotel San Jorge. This new condo complex is built around a former school founded in the early 1900’s by Blanche Kellog (her brother invented Kellog’s Corn Flakes). Only the facade of the original ‘Spanish Mission Revival’ building remains – with an outdoor exhibit of Santurce’s past, murals by renowned mosaic artist Eddie Ferrraioli and special events that take place on the plaza and several galleries. A former movie palace, this is one of the most important theaters for dramatic plays and intimate dance performances in San Juan. Just 3 blocks from Hotel San Jorge on Calle Del Parque. San Juan’s experimental performance space – just 4 blocks from the hotel and always an interesting audience experience. Another former movie theater is now the most popular ‘cafe-theater’ or cabaret in San Juan. Just around the corner from the Teatro Arriví just 3 blocks from Hotel San Jorge. Formerly known as ‘El Josco’. Calle del Parque is also the location of the Architects’ Society which has frequent exhibits, seminars and special events featuring various aspects of San Juan’s architecture and urban planning. Past events have included walking tours, outdoor exhibits and even silent movies on the plaza. 4 blocks from Hotel San Jorge, next to San Jorge Children’s Hospital. One of the best private art collections in the Caribbean – look for this impressive gallery at 1414 Ave Fernandez Juncos – Just 6 blocks from Hotel San Jorge. By appointment only – so call before you go! Make sure to note the ‘voluminous’ sculpture Reclining Woman by Colombian artist Fernando Botero just across from the Puerto Rico Museum of Art. San Juan’s favorite ‘classic movie palace’ has been broken up into 3 cinemas – but you can still get a taste of its elegant past when you catch a first run movie or live telecast of the Metropolitan Opera. Just across from the Museum of Contemporary Art – about a 20 minute walk or short bus ride down Ponce de Leon Ave. The new home of the Puerto Rico Conservatory of Music is a bit far to walk – about 25 minutes, but the bus will get you there is about 8 minutes. Frequent performances in the plaza overlooking Condado Lagoon and the stunning new recital hall should be open by early 2012. Sacred Heart University is less than a 10 minute walk from Hotel San Jorge down the hill toward the ‘Tren Urbano’. Watch for special events sponsored by the university or just explore the grounds of one of the best private universities in the Caribbean. One of San Juan’s most vibrant theaters – the Teatro Coribantes is just beyond the urban train station. Home of San Juan’s gay-friendly theater, there are frequent theater festivals, seminars and training classes. Performances are mostly in Spanish of contemporary ‘Broadway-style’ dramas, but the experience is universal. You’ll find great graffiti all over the arts district – this was one of the best until it was recently painted-over by a real estate agency trying to see the building. You’ll find other examples all over Santurce – but grab a photo, you never know when our vibrant street-scene will get painted-over. Our neighborhood has one of the largest collections of ‘Modernismo’ architecture which was brought to Puerto Rico from Barcelona. Look for vertical lines, boxes and a streamlined attitude starting with this building one block from our hotel. Hotel San Jorge not only has our own gay bar on the Ponce de Leon side of the building – we’re an easy walk or short bus ride to all of San Juan’s gay nightlife. Check out this Gay Guide to Santurce. Our neighborhood is often the site of film production. This on-location filming took place just down the street from Hotel San Jorge in front of our neighborhood supermarket that was converted to a ‘New York Neighborhood’ for the day of the filming. Its not easy to find out when films will be shot on-location, but you may find yourself in the middle of all the action during your stay in San Juan.